I know it’s slightly cliche, but I really do love giving just as much as I love receiving. This time of year you can find me scouring various websites for unique gifts that I know my food loving friends will love. 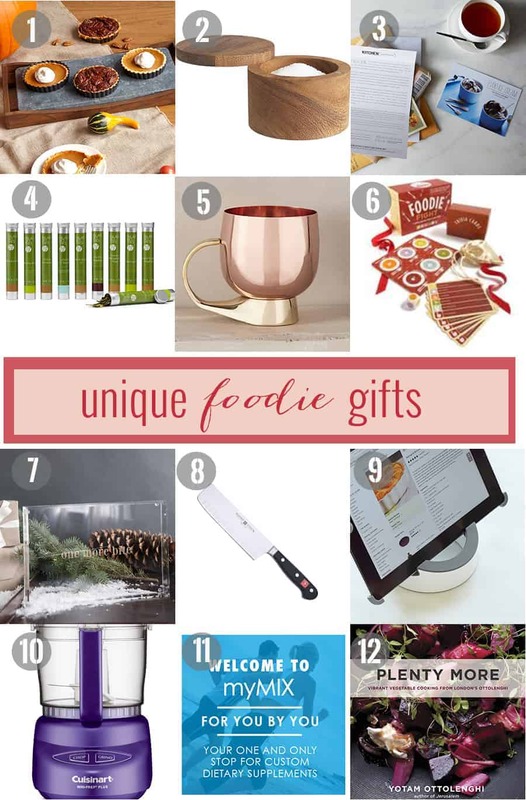 As I scooped up most of these gifts for friends and family this year, I thought it would be fun to share with you my favorite unique foodie finds for the people on your list who love cooking, eating, and entertaining. 1. Oven to Table Entertainment Platter ($65) // I love the idea of this oven to table platter. Perfect for keeping appetizers hot or cool dishes cool. 2. Bamboo Salt Box ($25)// One of my favorite kitchen items is the antique salt box I bought in Denmark several years back. It sits right next to my stove, and is the perfect vessel for holding finishing salt. This bamboo box is a gorgeous hostess gift and perfectly complements any kitchen decor. For an extra special gift, consider throwing in a box of my favorite salt, Maldon Sea Salt. 3. A Year of Kitchen Letters/Recipes from your favorite Chefs ($60) // Looking for a truly unique gift? Consider this exclusive subscription that allows you to get up close and personal with the world’s best chefs. An annual subscription includes two recipes and two letters per month. 4. Teas from Around the World ($55) // Have a tea lover in your life? Give this collection of 10 unique teas from around the world. In addition to the many varieties, each flavor has an informative book full of background information and brewing tips. 5. Moscow Mule Mugs ($24) // I love beautiful glassware to serve drinks in, especially over the holidays. These brass Moscow Mule mugs would be the perfect hostess gift! 6. Foodie Fight Board Game ($23) // The perfect ‘foodie’ gift! I bought this board game last month and can’t get enough of it! Over 1,000 questions on everything from food science to celebrity chefs and exotic cuisine. Family food fight, anyone? 7. One More Bite Lucite Tray ($34) // Another beautiful hostess gift! This lucite tray is perfect for the person on your list who loves entertaining as much as I do! 8. Wusthof Classic Nakiri Knife ($119) //If there’s one knife I recommend, this is it! It’s a Japanese style “vegetable cleaver” that will cut vegetable prep time in half. The super thin blade makes chopping a breeze. While it’s a little on the pricy side, this knife will last for decades. 9. Tablet Stand ($35) // Perfect for the tech-savvy cook or anyone who favors blog recipes over cookbooks. This tablet stand helps display recipes clearly either horizontally or vertically. 10. Mini Food Processor ($39) // I use my food processor for just about every recipe. This is the perfect gift for someone who is building their kitchen toolbox. For less than $40, this mini processor makes everything from chopping vegetables to salad dressings and hummus. 11. My Mix Nutrition (varies) // DIY Nutrition Supplements! Friends, I LOVE this idea! You get to design a protein mix based exclusively on your needs and wellness goals. Customizable elements include protein type, flavor and add-ins of the highest quality vitamins, minerals and enhancers to include in your unique mix. While this would make a great gift, you can also get smaller sizes for stocking stuffers. The best part? After you name your mix, the gift bag comes with a personalized label! Perfect for husbands, siblings, or friends who are health-conscious. 12. Plenty More Cookbook ($21) // A must cookbook for any veg-minded cook. This cookbook is from chef extraordinaire Yotam Ottolenghi of previous Jerusalem fame. This cookbook is not only beautiful to look at, the recipes highlight just how delicious vegetables can be. I LOVE my mini food processor!!! It is amazing! Thanks hannah! Me too! it’s a must for me for so many of my recipes! I love this! That board game looks so fun, haha! Hi Alex! What a great list of gifts for foodies. These are all a little advanced for me, but I know some others who may die over these items. However, I did get into some fancy loose leaf tea lately that really opened me eyes. Have you ever heard of a salt block for cutting? I bet that’s up your alley. Hope you’re doing well! Thanks ashley! I haven’t heard of a salt block before… but googling it now! OMG I would totally FAIL at that Foodie Fight Board Game! I just clicked on it… And the questions are HARD – so perhaps I will just go for the mini food processor! LOL! And that’s why I buy these games ahead of time, go through all the questions, and pretend like I am a #foodgenius when we play with friends! Kidding but not really kidding. They are hard but kinda fun!